The imagination of a child is a wonderful, magical thing. As my daughter grows older, I sometimes can't help but just watch her play, listen to the stories she comes up with, the scenarios she invents for her toys and dolls. I have noticed the ability she has to create grand ideas and worlds with her mind, totally losing herself in them with a look of joy in her eyes that words can't describe. Even if I had the worst day at work, when I walk in the house and see her playing with 20 different toys at once, doing a different voice for each without even skipping a beat, all is right in the world. 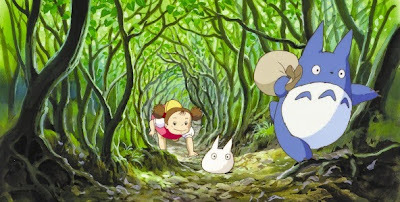 This was my second viewing of My Neighbor Totoro, but something about this time felt totally different and new to me. I connected with it on a far greater level, striking a chord in me that I didn't notice during my debut screening. I felt emotional throughout, whether it be a smile I couldn't get rid of or tears from watching a child lost and alone. I felt a deep compassion for the father, something I don't recall experiencing before. He is a man with a lot on his plate, moving into a new home with his two daughters while his wife, their mother, is ill in the hospital, yet he still takes the time to ensure they are having fun, encouraging their imaginations to not only exist but to flourish in new and exciting ways. I love this film, quite possibly one of, if not the greatest achievement in the history of animated films. 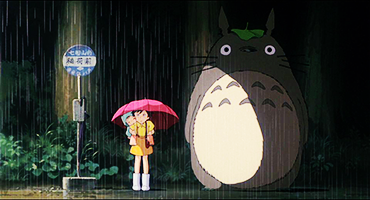 My Neighbor Totoro may technically feature a simple story, but it's message is meaningful, touching and important. Sometimes a Father can do everything he can to be there for his kids, but it still isn't enough. Sometimes a friend who shares no blood can step in and fill their lives with love and warmth, but even so something is missing. Sometimes a child just needs a Totoro.